So I thought it was high-time I share one of my favorite ways to enjoy roasted eggplant. Sweet and tender roasted Japanese eggplant (char-grilled a little at the end) served with sesame tahini sauce. A dream combination. But that’s not all. There are garnishes. Pomegranate, pine nuts and parsley. P-P-P. Three important P’s. The crème de la crème that pulls everything together for the most perfect, delicious side dish. Are you familiar with mini-aubergine (a.k.a Japanese eggplant)? This year, it has been popping up more and more at my local supermarket. And since it has turned into more than just a once-off occurrence I thought it would be time to share a recipe using these sweet and slender eggplants. How do you cook “mini” Japanese eggplants? The answer is actually pretty simple. Because they have a thin and tender skin and are sweeter, with a more delicate flavor, than regular eggplants, this opens up all kinds of fabulous ways to cook with them. There is no salting needed, nor would it make sense to peel them. They are fantastic grilled on the BBQ, or sliced into rounds for a quick and tasty stir-fry, or just like in this simple recipe, sliced lengthwise and roasted in the oven. Look for them in larger supermarkets (I get mine at REWE) or sometimes you can find the Italian version called perlina eggplant (also referred to as mini aubergine) at your local farmers market. This side dish calls for basic ingredients but delivers amazing flavor. It’s simple to make and if you are already interested in Middle Eastern cooking, then you probably already have most of the ingredients on hand. You’ll notice it’s also special diet-friendly — meaning it is perfectly suitable for anyone following a vegan, vegetarian, gluten-free or dairy-free diet. And because it’s so delicious you might want to double up the recipe or simply adapt it so that you could enjoy it as light meal for lunch or dinner. This roasted Japanese eggplant recipe goes perfectly well with quinoa or bulgur. Or…do as I do and eat it as it is as a stand alone meal for one! Having a moment with eggplant? Then go to my ingredient page and filter on eggplant so you can check out some more of my favorite eggplant recipes on Elle Republic. And if you have extra Japanese eggplant on hand, check out my recipe for roasted mini-aubergine with tomatoes. It’s bursting with Mediterranean flavors and is really delicious! Love to hear from you, so please let me know how this turns out for you in the comments! 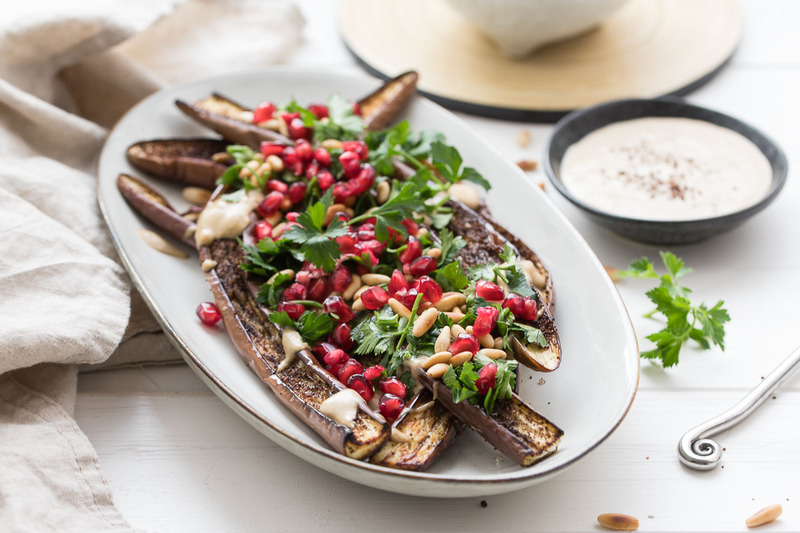 This recipe for roasted Japanese eggplant with tahini sauce is the BEST! It makes and easy and tasty side dish for two. So delicious you may want to double it up OR enjoy it as a main dish. It's terrific served with bulgur and a side of sweet roasted cherry tomatoes. This recipe is naturally vegan and gluten-free. Preheat the oven to 400°F / 200°C and line a baking sheet with parchment paper. Place the eggplant halves on the baking sheet. Using a knife, cut a crisscross pattern in the flesh, being careful not to pierce the skin. In a small mixing bowl, combine the olive oil and sumac. Brush both sides of eggplant slices with the oil mixture, place cut-side up and season each piece with a sprinkle of salt. OR...Alternatively brush the eggplant with olive oil, place cut side up on the baking sheet and sprinkle with sumac and a little salt. Roast eggplant in the pre-heated oven, until very tender, about 20 minutes. Remove from oven and arrange a rack in upper third of oven and heat to broil. Broil the eggplant until golden and lightly charred in a couple places, 2-3 minutes, depending on the strength of your broiler (keep an eye the them!). Meanwhile, as the eggplant is roasting in the oven, prepare the tahini yogurt sauce and toast the pine nuts in a dry skillet over medium heat until fragrant. In a small bowl, add the tahini, lemon juice, garlic and cumin and stir to combine. Add water as needed to create a smooth sauce. Season to taste with salt and pepper. Set aside. 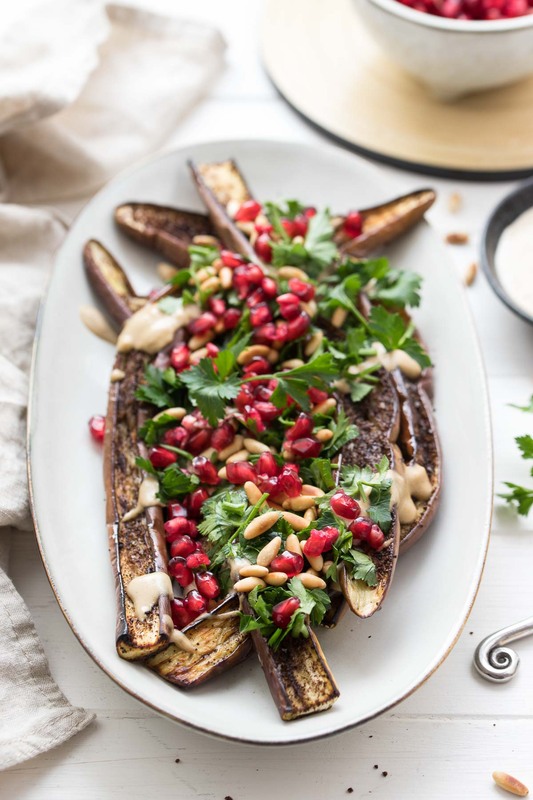 Transfer the eggplant to a serving plate, drizzle with the tahini sauce and scatter the pomegranate seeds, pine nuts and parsley leaves over top. Sumac can be found in Turkish and Middle Eastern shops, or in large supermarkets. Alternatively it can be ordered online. Japanese eggplants are found in larger supermarkets, alternatively Italian perlina eggplants can be used. And naturally, feel free to try this recipe with regular eggplant as well! Roast for 35 to 40 minutes, at which point the flesh should be soft, flavorful and nicely browned. 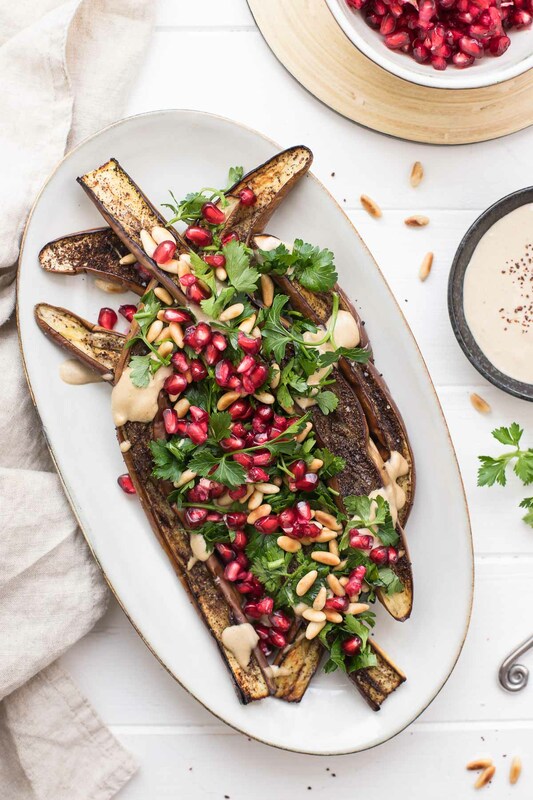 If you make this Roasted Japanese Eggplant with Tahini Sauce recipe, I’d love to hear how it turned out for you! Be sure to rate it and leave a comment below to let me know! Especially if you have tips for other readers. Or take a picture and tag me on Instagram @ellerepublic and don’t forget to hashtag #ellerepublic so I don’t miss it!